"Few management books are specific to salespeople and those of us who work with salespeople understand they're a different breed. Keith Rosen's book is an essential daily coaching playbook to study and apply today. His innovative coaching framework is refreshingly practical for every conversation and easily executed in a matter of minutes." "I see tremendous value for anyone who reads this book. If you embrace Keith's philosophy around coaching, you can certainly expect to win in all areas of your life, while making a profound and measurable impact on your salespeople's performance and attitude." "Fluffless! Rosen continues to give practical, A-to-Z how-to advice. After you read it, simply do it!" "Where most books on sales management are filled with biased ideology and abstract concepts, Keith Rosen's book is refreshingly practical. It contains concrete steps on what to coach, how to coach, and how to bring out people's hidden talents without resentment or frustration. This is clearly the best book on sales coaching I've seen in a decade." "Keith has done a tremendous job outlining the importance of coaching versus managing. 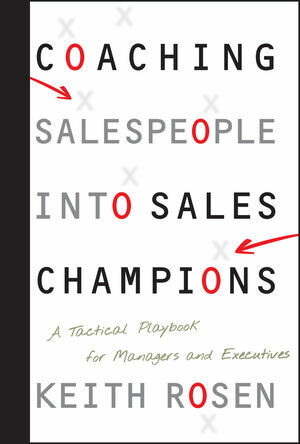 Implementing Keith's playbook will drive the development of high-performance salespeople and superior results." "Coaching Salespeople Into Sales Champions is a well written, easily readable, practical book for anyone who manages salespeople. Excellent content is combined with real case studies, coaching templates and action steps that make this book a must read and a desktop reference for every sales manager, executive and business owner." KEITH ROSEN is the CEO of Profit Builders, named one of the Best Sales Training and Coaching Companies worldwide. Keith has delivered his courses to hundreds of thousands of salespeople and managers in practically every industry; on five continents and in over 50 countries. Keith is the author of several bestselling books. As a global authority on sales coaching and the pioneer of leadership coach training, Keith was inducted in the inaugural group of the Top Sales Hall of Fame in recognition for his outstanding contributions in sales and leadership development. Inc.magazine and Fast Company named Keith one of the five most influential executive coaches. Keith was also featured on the award winning television show, Mad Men and was one of the first out of only a handful of coaches who earned the distinguished Master Certified Coach designation credentialed through the International Coach Federation. To get Keith's ebooks, articles and videos, visit www.KeithRosen.com.